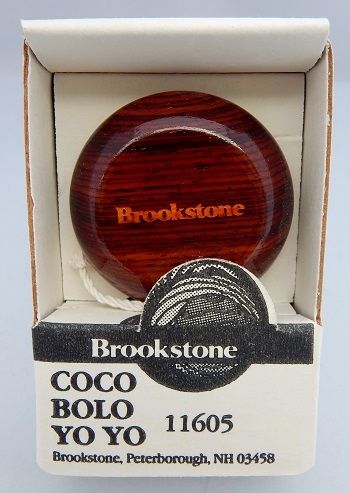 At the time, Brookstone retail stores were known for their upper-end executive type toys such as this yo-yo. This executive model was made for Brookstone by Hummingbird Toy Company. The yo-yo is made from Cocobolo wood which has variegated tones of red and orange with darker contrasting grain lines. The grain of these yo-yos is often swirly and tight. Cococbolo grows in the Sierra Madres in western Mexico and throughout Central America. The yo-yo itself has two halves glued onto an axle--typically known as "three piece construction". Gluing cocobolo wood is very difficult due to its density. If the halves come apart from the axle, an epoxy must be used to reglue. Packaged in the original Brookstone box. Came with a velour storage pouch and a twenty-page instruction booklet.